Are you sure, you want to add The Man Who Killed Don Quixote to your wish list? Toby, a cynical advertising director finds himself trapped in the outrageous delusions of an old Spanish shoe-maker who believes himself to be Don Quixote. In the course of their comic and increasingly surreal adventures, Toby is forced to confront the tragic repercussions of a film he made in his idealistic youth - a film that changed the hopes and dreams of a small Spanish village forever. Can Toby make amends and regain his humanity? 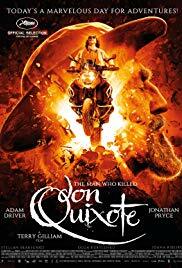 Can Don Quixote survive his madness and imminent death? Or will love conquer all? Are you sure, you want to buy The Man Who Killed Don Quixote? Are you sure, you want to order The Man Who Killed Don Quixote ?